Today Upia sews T-shirts for $3.02 an hour, a huge leap in income and nearly three times the country’s minimum wage. She has paid off her loans and can shop again at the grocery store. She has purchased a refrigerator, plans to add rooms to her home to rent out for additional income and has paid for her son Nisael’s long-postponed dental work. Her son Yacer is studying accounting at the university. Upia was among the first workers hired by Alta Gracia, an apparel company named after the town where she has lived all her life and where the factory is based. Alta Gracia’s T-shirts and sweatshirts are sold mainly at US colleges and universities at about the same prices as clothing made by Nike, Russell and other brands. Beginning in the mid-1990s, students on American campuses used various forms of protest to pressure universities to adopt “codes of conduct” as a condition of allowing companies the rights to use their names, mascots and logos. But implementing these standards proved to be extremely difficult. College-bound goods are just a small fraction of the products made by the thousands of apparel factories around the world. Monitoring all these workplaces is impossible. For years United Students Against Sweatshops (USAS) refused to support companies claiming to make “sweatshop-free” clothing, because they couldn’t be sure the companies would keep their commitment. Today, however, USAS, as well as the Worker Rights Consortium (WRC), the independent labor rights watchdog founded in 2000 to help enforce the “codes of conduct,” have embraced Alta Gracia as a model that proves socially responsible clothing production is not only possible; it’s profitable. Alta Gracia is the first apparel company in the college market to work closely with unionized employees and pay them a living wage. It is an unusual collaboration between student, labor, and human rights activists and Knights Apparel, the nation’s leading producer of college clothing, which beats Nike and Adidas in dominating the $4 billion collegiate market. The Worker Rights Consortium, a global network of in-country field representatives, monitors factory conditions in response to workers’ complaints and publishes its reports online. Unlike other organizations that claim to certify and monitor factory conditions overseas, the WRC refuses to accept funding from any company – including Alta Gracia. This avoids the conflict-of-interest that can lead other organizations to favor management (who often pay the certifier fees) over workers. WRC views its role as holding companies accountable by shining the light of publicity on them. It operates on the basis that workers are the best source of information about the day-in day-out realities of their workplaces. WRC works closely with a network of human rights groups around the world who get information about working conditions directly from employees. This is much preferable to having corporate accounting firms and other business-oriented consultants parachute into countries to examine clothing factories, often after alerting management that they are on their way. Paralleled by pressure from USAS, WRC’s investigations have forced many brands to improve conditions at some factories making clothing for the college market. USAS has achieved unprecedented victories with two of the largest companies — Russell and Nike in 2009 and 2010 by pressuring their schools – and even retailers – to cut contracts with brands. This student-led boycott cost the corporations millions in sales until they came into compliance with the campus’ codes of conduct. USAS’s victories in their campaigns against Russell and Nike demonstrated that college students were ready to throw their weight behind a living-wage union-made option in their purchases as well as their actions. If students would fight against brands that abused workers’ rights, wouldn’t they rally behind brands that respected them? That’s how the idea for the Alta Gracia brand started. Two key players were Joe Bozich, the CEO of Knights Apparel, and Donnie Hodge, the company president. “We started thinking that we wanted to do something more important with our business than worry just about winning market share,” Bozich explained. Student activists and labor experts began conversations with Knights executives about whether the economics of clothing production allowed for “the perfect factory,” one that could produce well-made items in a safe workplace and pay workers decent wages and benefits. Worker abuse surfaces on factory floors, but it is rooted in the dynamics of the global apparel industry, in which so-called manufacturers — in reality, design and marketing firms — outsource the fabrication of clothing to independent contractors worldwide. In this labor-intensive industry where capital requirements are minimal, it is relatively easy to open a clothing factory. This has led to a global race to the bottom: there is always someplace, somewhere, clothing can be made still more cheaply. Today more than 90 percent of the clothing in US retail stores is imported. They elected a site in the Dominican Republican where a Korean-owned plant had once made clothing for Nike and Reebok. The company, BJ&B, had shut the factory down after its employees unionized. But its workers had forged ties with American activists, and USAS leaders convinced the Knights executives that students would encourage their peers to buy clothing produced there. In February 2010, after a $500,000 renovation based on recommendations with the Maquiladora Health and Safety Support Network, the Alta Gracia facility opened for business. The new factory is far livelier than other nearby workplaces. Bachata music and workers’ chatter are constant background noise. The factory has good ventilation, plenty of windows, and overhead lighting help workers avoid eye-strain. At Alta Gracia, workers have a union – a voice on the job. 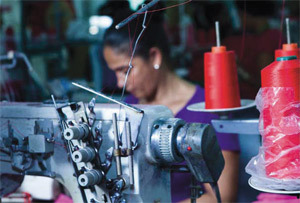 In the Free Trade Zones of the Dominican Republic and around the world, unions are often the only hope garment workers have of enforcing basic human rights at work – water breaks, bathroom breaks, not being fired for being pregnant, fighting back against sexual harassment and discrimination. While workers at Alta Gracia don’t face these challenges, Sitralpro, Alta Gracia’s independent union, serves as one more democratic check-and-balance on management. During its formation, the vote took place in front of the factory with no opposition from management. In fact, the company and the union jointly sponsor employee workshops, on company time, about workers’ rights, conducted by the Dominican Labor Foundation. The union and management have a joint health and safety committee, and the union conducts vaccination programs, free financial management and English courses and HIV prevention workshops. The union and management meet regularly to discuss production, employee morale and potential improvements to the facility. The survival of Alta Gracia will largely hinge on whether consumers are aware of the brand and its message. On many campuses efforts to promote it are in full swing. At the University of Maryland, students have circulated fliers reading, “Your sweatshirt can be a force for change in the world.” Other campuses have held fashion shows of union-made clothing. USAS sponsored two Alta Gracia workers who toured fourteen campuses from North Carolina to Boston. At Yale the visit inspired a student petition to get the university to purchase Alta Gracia T-shirts to distribute to incoming freshmen, at alumni reunions and other special events. Whether campus bookstores prominently display Alta Gracia apparel makes a big difference. Some managers are reluctant to promote the label, which competes with brands like Nike, which pay universities huge licensing fees for the right to use their names, logos and mascots on the clothing they produce, mostly in Asian sweatshops. But others, like Jim Wilkerson, who runs Duke University’s twenty-seven campus stores, have championed the Alta Gracia brand with great success. At Duke’s flagship store, Alta Gracia merchandise is prominently displayed and stocked, and a large flat-screen TV plays a video of smiling workers. Such efforts have paid off: since August 2010, Duke has sold more than $600,000 of Alta Gracia’s clothing. So far it’s thriving. Large schools like the universities of Missouri, North Carolina, Washington and Wisconsin as well as NYU and UCLA carry sizeable orders of Alta Gracia. With great fanfare, students at Notre Dame selected Alta Gracia as “The Shirt” that fans, alumni, and students wear to the first football game of the year and whose sales proceeds are donated to charity. Alta Gracia contracts with Ethix Merch, a distributor of socially responsible merchandise, to sell custom printed T-shirts to social justice groups, faith communities, workplaces, and others, so every-day consumers can join the effort outside the college arena. Can the Alta Gracia label compete with Nike’s swoosh? Are consumers willing to look for the Alta Gracia union label? If Alta Gracia can make profitable merchandise under humane conditions and sell it at competitive prices, it will challenge the basic race-to-the-bottom economics of the apparel industry and prove that conscientious consumers can have an impact on humanizing the forces of global capitalism. “The only guarantee we have to keep this factory operating in our community and as a model for the industry is support from student and consumers in the US,” says union leader Pablo Tolentino. Have you tried speaking with bigger retailers, other than universities, about selling your Alta Gracia products? And also, do you know if there are other factories that are trying to either open up or change their regulations because of how your factory has changed?